By coincidence, the announcement came just days after a jury in Saskatchewan acquitted a farmer who had shot and killed a 22-year-old Cree man. Mr. Trudeau met with relatives of the man, Colten Boushie, on Tuesday. The family members said the police had treated them more like criminals than victims and had conducted an inadequate investigation. They also contended that Indigenous people were excluded from the jury because judicial rules allowed defense lawyers to dismiss up to 14 potential jurors without explanation. 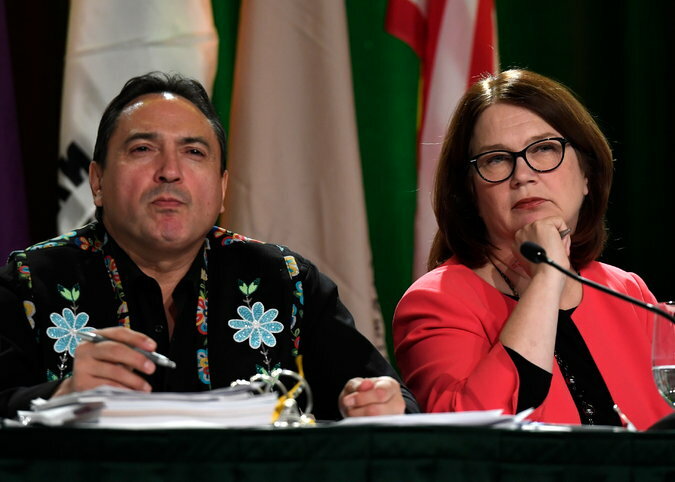 Perry Bellegarde, national chief of the Assembly of First Nations, and Jane Philpott, Canada’s minister of indigenous services, at a special assembly meeting in Ottawa last year. Mr. Trudeau said on Wednesday that the government would use the meetings, known as consultations, to determine how jury selection could be changed. During his speech, Mr. Trudeau said that his father, former Prime Minister Pierre Trudeau, initially did not want to include Indigenous rights when Canada created its current Constitution in 1982. While pressure from aboriginal groups and their supporters reversed that stance — and the Constitution does enshrine the rights of Indigenous people — the younger Mr. Trudeau acknowledged that there had been widespread disappointment about the effectiveness of the protections. He attributed that in part to the failure of successive governments to make significant legal changes and introduce other measures to ensure that Indigenous people have the rights the Constitution promises. Numerous commissions and studies, particularly a 1991 inquiry, have proposed reworking the legal system to guarantee Indigenous rights and allow aboriginal people to run their own affairs. The consultations will be led by Jody Wilson-Raybould, the justice minister, and Carolyn Bennett, the Indigenous relations minister, with the aim of putting changes in place by fall 2019.